Chinese travelers are family-oriented and deal-driven explorers who plan travel around food and drink and fill their itinerary with museums, historical sites and arts and culture. They prioritize feeling pampered, activities they will be doing on their trip and once in a lifetime experiences, and approximately 66 percent or more plan and book their trip via an online travel agency (OTA). Below is a snapshot of Chinese travelers across each generation – subscribe and check out our blog to see snapshots of travelers from other countries. 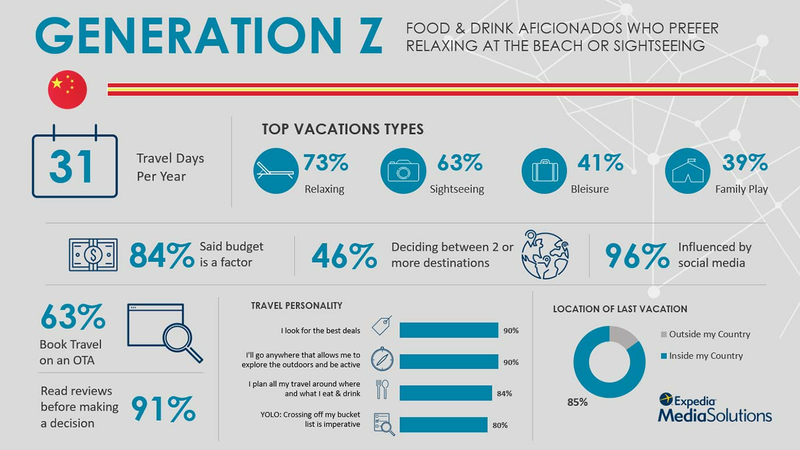 Gen Z averages 31 travel days per year, and nearly half are deciding between two or more destinations. Gen Z are influenced by social media (96 percent) and 91 percent of Gen Z read reviews before making a travel decision, while nearly half said they can be influenced by ads with helpful reviews. 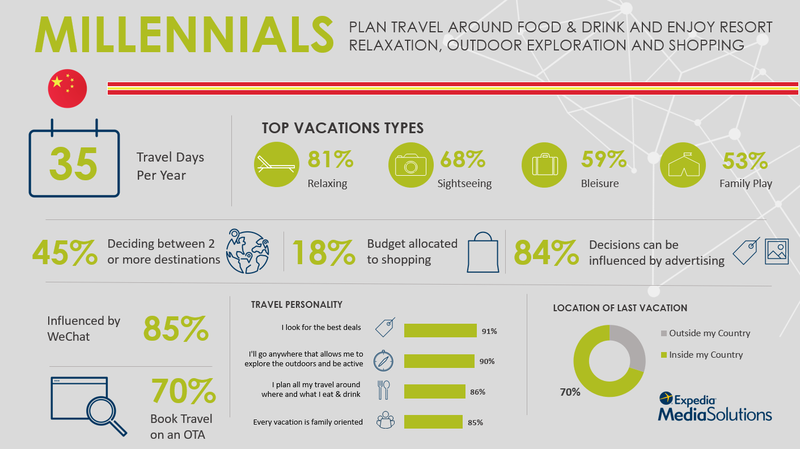 Of all the generations, Millennials travel the most, with 35 travel days a year, and more than 30 percent travel internationally. They allocate the largest portion of their budget to shopping (18 percent), followed by hotel, attractions, tours and food. 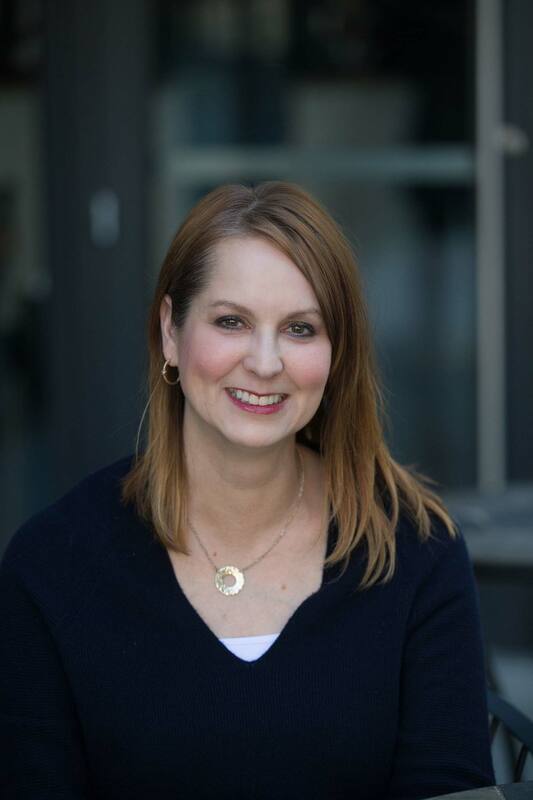 More than 93 percent of Millennials said informative content from destinations and travel brands can influence their decision, while more than 68 percent said ads with appealing imagery and ads with informative content can be influential as well. Gen X are the most likely generation to travel abroad (33 percent), and allocate the largest percentage of their budget to their hotel. 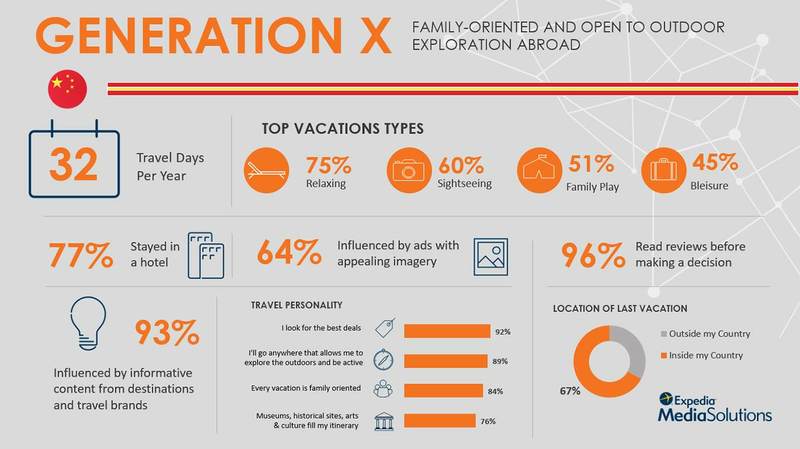 More than half of Gen X take family play vacations or trips geared toward kids’ activities. 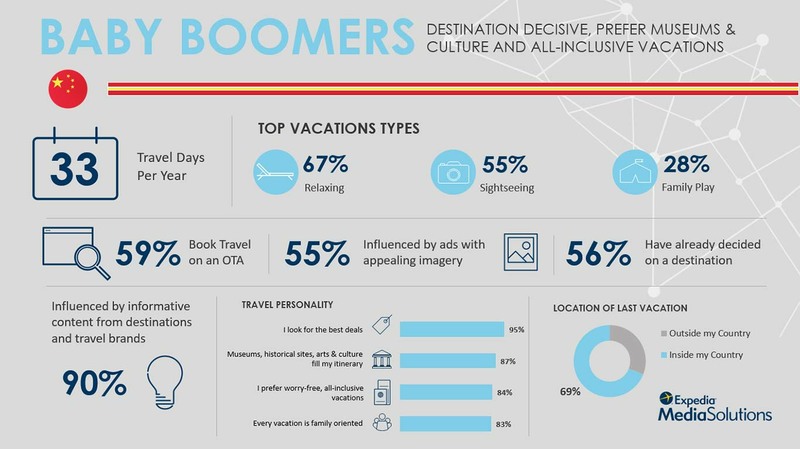 For Boomers, budget is less likely to be a primary factor when researching and booking a trip, and while more than half have already decided on a destination, 90 percent said they are influenced by informative content from destinations and travel brands. For their preferred vacation types, 87 percent of Boomers fill their itinerary with museums, historical sites and arts and culture, and 84 percent said they prefer all-inclusive vacations.